For the reddish color, see Burgundy (color). For other uses, see Burgundy (disambiguation) and Bourgogne (disambiguation). Burgundy (/ˈbɜːrɡəndi/; French: Bourgogne [buʁɡɔɲ] ( listen)) is a historical territory and a former administrative region of France. It takes its name from the Burgundians, an East Germanic people who moved westwards beyond the Rhine during the late Roman period. The first recorded inhabitants of the area that became Burgundy were Celts, who were eventually incorporated in the Roman Empire as Gallo-Romans. During the 4th century, the Burgundians, a Germanic people, who may have originated in Bornholm (on the Baltic Sea), settled in the western Alps. They founded the Kingdom of the Burgundians, which was conquered in the 6th century by another Germanic tribe, the Franks. Under Frankish dominion, the Kingdom of Burgundy continued for several centuries. Later, the region was divided between the Duchy of Burgundy (to the west) and the Free County of Burgundy (to the east). The Duchy of Burgundy is the better-known of the two, later becoming the French province of Burgundy, while the County of Burgundy became the French province of Franche-Comté, literally meaning free county. Burgundy's modern existence is rooted in the dissolution of the Frankish Empire. 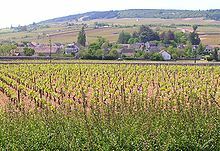 In the 880s, there were four Burgundies, which were the Kingdom of Upper and Lower Burgundy, the duchy and the county. During the Middle Ages, Burgundy was home to some of the most important Western churches and monasteries, including those of Cluny, Cîteaux, and Vézelay. Cluny, founded in 910, exerted a strong influence in Europe for centuries. The first Cistercian abbey was founded in 1098 in Cîteaux. Over the next century, hundreds of Cistercian abbeys were founded throughout Europe, in a large part due to the charisma and influence of Bernard of Clairvaux. The Abbey of Fontenay, a UNESCO World Heritage site, is today the best-preserved Cistercian abbey in Burgundy. The Abbey of Vezelay, also a UNESCO site, is still a starting point for pilgrimages to Santiago de Compostela. Cluny was almost totally destroyed during the French Revolution. During the Hundred Years' War, King John II of France gave the duchy to his youngest son, Philip the Bold. The duchy soon became a major rival to the crown. The court in Dijon outshone the French court both economically and culturally. In 1477, at the battle of Nancy during the Burgundian Wars, the last duke Charles the Bold was killed in battle, and the Duchy itself was annexed by France and became a province. However the northern part of the empire was taken by the Austrian Habsburgs. With the French Revolution in the end of the 18th century, the administrative units of the provinces disappeared, but were reconstituted as regions during the Fifth Republic in the 1970s. The modern-day administrative region comprises most of the former duchy. Burgundy: Côte-d'Or, Saône-et-Loire, and southern half of Yonne. This corresponds to the old duchy of Burgundy (later called province of Burgundy). However, the old county of Burgundy (later called province of Franche-Comté) is not included inside the Burgundy region, but it makes up the Franche-Comté region. 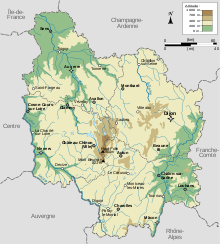 Also, a small part of the duchy of Burgundy (province of Burgundy) is now inside the Champagne-Ardenne region. Nivernais: now the department of Nièvre. 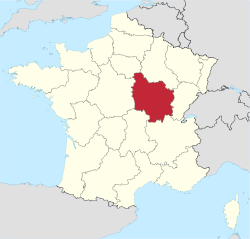 the northern half of Yonne is a territory that was not part of Burgundy (at least not since the 11th century), and was a frontier between Champagne, Île-de-France, and Orléanais, being part of each of these provinces at different times in history. The climate of this region is essentially oceanic (Cfb in Köppen classification), with a continental influence (sometimes called a "half-continental climate"). The regional council of Burgundy was the legislative assembly of the region, located in the capital city Dijon at 17 boulevard de la Trémouille until its merger to form the regional council of Bourgogne-Franche-Comté. Chardonnay vineyards in the south of the Côte de Beaune surrounding the town of Meursault. Earlier, the southeastern part of Burgundy was heavily industrial, with coal mines near Montceau-les-Mines and iron foundries and crystal works in Le Creusot. These industries declined in the second half of the twentieth century, and Le Creusot has tried to reinvent itself as a tourist town. Chisholm, Hugh, ed. (1911). "Burgundy" . Encyclopædia Britannica (11th ed.). Cambridge University Press. ^ "Burgundy". Paris Digest. 2018. Retrieved 10 August 2018. Wikisource has the text of the 1911 Encyclopædia Britannica article Burgundy. Lecomte, Bernard; Thouart, Jean-Louis (2004). Burgundy, What a Story! (de Bourogne ed.). ISBN 978-2-902650-02-6. Davies, Norman (2011). "Ch.3 : Burgundia: Five, Six or Seven Kingdoms (c. 411-1795)". Vanished Kingdoms: The History of Half-Forgotten Europe. London: Allan Lane. ISBN 978-0-141-04886-4. INSEE. "Produits intérieurs bruts régionaux et valeurs ajoutées régionales de 1990 à 2012". Retrieved 4 March 2014. "Burgundy" . Catholic Encyclopedia. 1913. "Burgundy" . The New Student's Reference Work . 1914.